G2 features 96kHz sampling rate and 24-bit converters, plus up to 5 second of delay, built-in tuner, and drum machine. G2 boasts 32-bit processing, 96kHz sampling rate, and 24-Bit A/D, D/A converters. The G2 digitally simulates the harmonic clipping of analog devices such as tubes and diodes of tube amps and vintage effects. A total of nine effects modules are included, including dynamics, ambience, drive, and modulation. Together they offer 54 types of effects. Use long delays or multi-tap delay of up to 5000 milliseconds. Select dynamic flanger and have the effect level controlled by picking intensity. Select from three types of modulation waveforms for the tremolo. Touch up the harmonic register with the six-band equalizer. The cabinet simulator even gives a choice of mic positions. With a 96kHz sampling rate, the warmth of a tube amp or the nuance of a vintage effect can be more accurately rendered. The 24-bit A/D, D/A conversion allows for plenty of dynamic range. The unit comes preprogrammed with a total of 40 preset effects patches, and memory space for 40 of your own creations. And when it comes times to change patches, that annoying delay when switching has been virtually eliminated. The G2 can change patches in 0.005 seconds according to the company. Also included in the G2 is a drum machines with 40 rhythm variations built-in. The tempo can be set with the tap tempo button, or with a footswitch (sold separately). 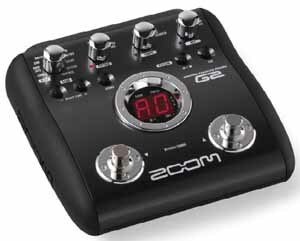 Like every Zoom pedal, the G2 has an integrated chromatic tuner built-in. The G2 runs on 4 AA batteries, or the included AC power adapter. An external footswitch and external expression pedal are also available to explore you performance capabilities.